There are few motor vehicle accident scenarios more terrifying than a rollover accident, and few as deadly. Each year in the U.S., rollovers lead to the wrongful death of about 10,000. This number accounts for nearly 1/3 of all car accident fatalities in the United States. A rollover accident happens when a car, truck or other vehicle is turned onto its side or roof. Rollover accidents killed 66 and injured more than 2,700 in Illinois in 2011, according to the Illinois Department of Transportation (ILDOT). In Missouri, 70 persons were killed and more than 1,800 injured, according to data from the Missouri State Highway Patrol Statistical Analysis Center. 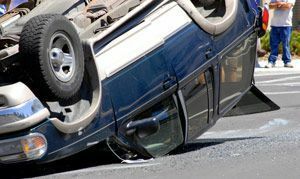 If you have been injured or lost a loved one in a rollover accident in Illinois or Missouri, you deserve to know your legal options. If the accident affecting your family was caused by another driver’s negligence, poor road conditions or defects in the involved vehicle, you could be entitled to compensation. The attorneys at The Tapella & Eberspacher Law Firm can make sense of your rights and help determine whether you have a claim. Fill out our FREE Case Evaluation form on this page to get started or call us today at (855) 522-5291. Rollovers can be categorized as either “tripped” or “untripped”. A tripped rollover is caused by external forces, such as when a vehicle strikes a curb or another vehicle. An untripped rollover is caused by forces having to do with the vehicle itself, such as speeding, road friction or steering mistakes. Rollover accidents are a risk on Illinois & Missouri roads, especially in top-heavy vehicles such as 15-passenger vans and SUVs. Large commercial trucks have the highest risk of rollover. An experienced rollover accident attorney can help determine whether you have a claim for your injuries. Rollover accidents are responsible for many deaths and injuries each year. Even when every occupant of the vehicle is wearing their safety belt, there are particular dangers that lead to severe injury in this type of accident. Flying debris, occupant ejection and other dangers contribute to the severity of injuries in rollovers. Also, in some vehicles, such as many SUVs, the roof may not have been constructed to meet the roof safety standards set by the National Highway Traffic Safety Administration (NHTSA). Because of the nature of a rollover accident, injuries can be severe if not fatal. For victims who are lucky enough to survive a rollover, the damage can be life-threatening and permanent. Very often, the injuries sustained in a rollover accident require extensive treatment which may include diagnostic tests, surgeries, and ongoing therapies. For many victims of rollover, the medical expenses can be overwhelming. If your rollover accident was caused by someone else’s negligence or by a defective auto part, you could be eligible for compensation for your medical expenses, pain, and suffering. The attorneys at The Tapella & Eberspacher Law Firm understand how horrifying the aftermath of a rollover accident can be, and we fight hard for the compensation rollover victims deserve. We work to determine the potential causes of your accident and establish the liable parties that contributed to your injuries. Find out how we can help today. Call (855)522-5291 today to get started now. To send your information directly to our legal staff, simply fill out the FREE Case Evaluation form on this page.